Traveling the northeastern United States with children can get quite expensive, especially if you're trying to go to a bunch of museums and amusement parks, but if you're visiting Philadelphia on your northeastern vacation, there are plenty of free attractions your kids are sure to enjoy. There are dozens of ways to keep the children in your life—and you—active, educated, and (most importantly) entertained without breaking the bank, and if you're not opposed to spending a bit of money for some fun, be sure to check out these top kid-friendly attractions in Philadelphia, too. From chemistry to arts and culture to history, several of Philadelphia's museums are free to both adults and children. Among them, The Science History Institute, the Institute of Contemporary Art, and the Edgar Allen Poe National Historic Site are the best for imaginative children who don't mind a bit of a cultural lesson on their vacation. Maker Jawn, a program that encourages students of all ages to use tech tools and everyday materials creatively, takes place at various libraries around the city weekly throughout the year. For the avid reader in your life, also consider checking out the Reading Olympics in May, which pairs six to 12 students with one coach who all compete to answer questions on 20 books that were selected by a committee of libraries and educators. If you're looking to kill an hour while waiting for a movie or concert to start, consider taking the 45-minute self-guided, family-friendly tour of the U.S. Mint, available every weekday between 9 a.m. and 4:30 p.m. Kids will enjoy seeing the coin-making process from 40 feet above the factory floor, discovering historic artifacts like the first coining press used in 1792, and meeting Peter the Mint Eagle, a real Bald Eagle who used to live at the First United States Mint (which was located in Philadelphia until 1833). From the hiking and biking trails of the Wissahickon to the playgrounds that dot Philadelphia's neighborhood parks, Fairmount has acres and acres of land for kids to explore. During the summer, Fairmount Park hosts a variety of family-friendly events and activities, so be sure to check the official schedule before your trip to find out when the next kids' event takes place. 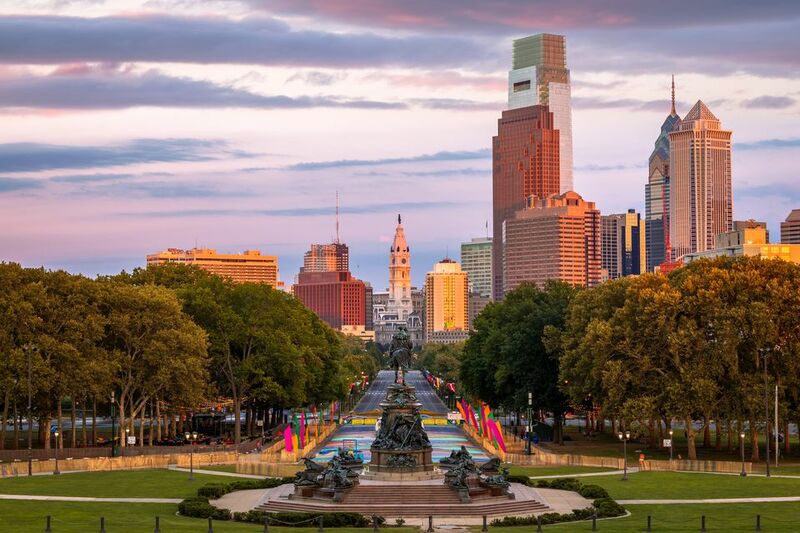 Fairmount Park is also home to the Smith Memorial Playground and Playhouse, the Philadelphia Zoo, and the Please Touch Museum, all of which are great destinations for kids of all ages. Several groups and venues across Philadelphia offer free concerts, especially in the summer. A few to check out include neighborhood concerts from the Philadelphia Orchestra, the Kimmel Center free summer series, and free summertime concerts at Penn's Landing. During the colder season, you can also check out the Kimmel Center's "Family Discovery Series," which invites families to enjoy a number of great kid-friendly shows and performances for a low discount price. Occasionally, the Lincoln Center also hosts free concerts and performances in the winter including the Kazakhstan Astana Ballet Gala on January 17, 2018, at the Alice Tully Hall. Children can enjoy free mural arts walking tours, a family-friendly First Friday scene, and even free art classes at the Fleisher Art Memorial, whose mission is to make art accessible to everyone—regardless of background, race, gender, or class. Winter classes began January 8 for 2018, and the summer programs kick into full gear in mid-May. Although this is another summertime tradition, various venues around Philadelphia run a free outdoor movie series that are perfect for an evening out with your children. Check out programs in Penn's Landing, Northern Liberties, Old City or along the Schuylkill Banks in this complete guide to free outdoor movies. Also be sure to check the Free Library of Philadelphia for free indoor movie screenings (like "Akheela and the Bee" on February 24, 2018) all year long. Explore the city by foot, learning as you go. With a variety of name-your-own-price walking tours to choose from, you're sure to find one that's right for your fmaily—no matter what age your kids are. One tour called "The Good, The Bad, the Philly" starts at the Free Library Central Branch and takes guests around Logan Circle to discover some of the city's hidden gems. Be sure to check Free Tours By Foot for a complete list of all the walking tours currently available (more can be found in the summer than winter). This suburban Philadelphia pick-your-own farm offers some free activities, including an area to look at farm animals, but is closed in the winter, which makes sense considering it's too cold to grow anything. However, be sure to check their full lineup of special family-friendly events in the summer. Philadelphia's city-run recreation centers offer several free and inexpensive children's activities, including athletics, art classes, and after-school programs. Specialized "​​Tot Rec​" activities for toddlers to learn art take place at the Boyle, Chalfont, Cione, Columbus Square, Fishtown, Fitzpatrick, Glavin, Holmesburg, Junod, Lackman, McIlvain, Mitchell, Monkiewicz, Max Myers, Palmer, and Picariello playgrounds as well as at recreation centers including the Bridesburg, Cohocksink, Hillside, Jardel, Kingsessing, Myers, Pelbano, Samuel, Vogt, and East Passyunk Community Recreation Centers. According to the refuge's website, it's "the largest remaining freshwater tidal wetland" in Pennsylvania. Entrance is free to all, which provides your family with opportunities for hiking, biking, canoeing, fishing, animal watching, and environmental education. Part of the NaturePHL series of free and cheap educational programs, the Schuylkill Center hosts several unstructured nature play dates led by educators from the Center as well as a CHOP pediatrician. Here, kids can climb, explore, and learn about the benefits of outdoor activities and time spent in nature. First constructed in 1744 by Peter and Rosanna Wentz as a German-style farmhouse, the Wentz Farm once served as headquarters for General George Washington during the fall of 1777. Purchased by the Schultz family in 1794, the Wentz Farmstead continued operating as a farm until 1969 when the county of Montgomery purchased it as a historical site. Now, the Peter Wentz Farmstead Society hosts a series of special exhibits throughout the year representing the Pennsylvania German culture and early American farm life. In April, Sheep Shearing Day brings a huge crowd out to the farmstead to watch as the farmers trim the sheep for the warmer seasons and experience other spring activities on this colonial farm. Highlights include open-hearth cooking, colonial toys and games, scarecrow building, a puppet show, and traditional music and crafts.